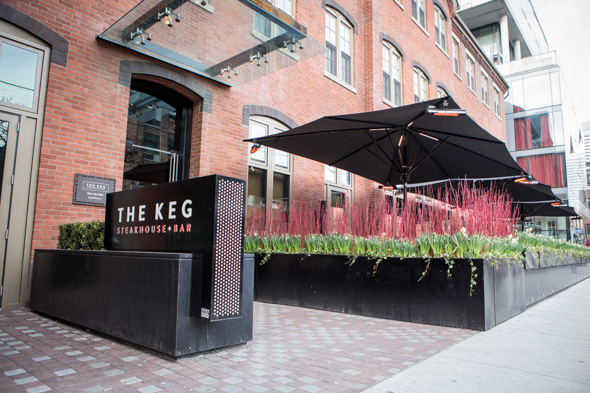 The Keg is a nationwide institution that operates 100 or so steakhouses coast to coast and even a few in the States. 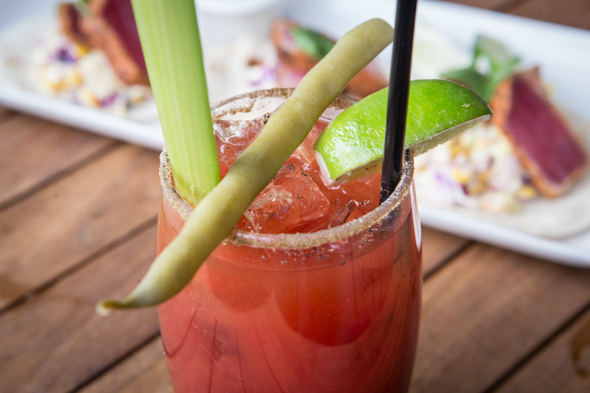 It's been around since 1971, and it's more than likely that you're already familiar with their formula of meat and potatoes, giant Caesar cocktails and 9oz wine pours. 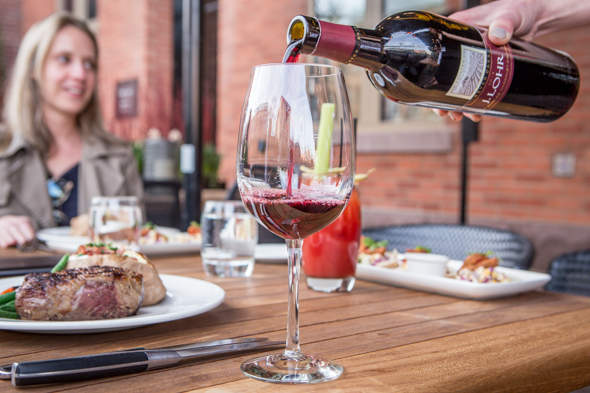 This new 260-seat restaurant on King St. occupies almost 10,000 square feet. The contemporary interior is divided into the bar and lounge, dining room and more intimate areas like the whisky tasting room, as well as a semi-private library. Massive fireplaces and floor-to-ceiling wine cabinets serve as the main focal points, while the furnishings throughout are a mix of club chairs, dining tables and booths. 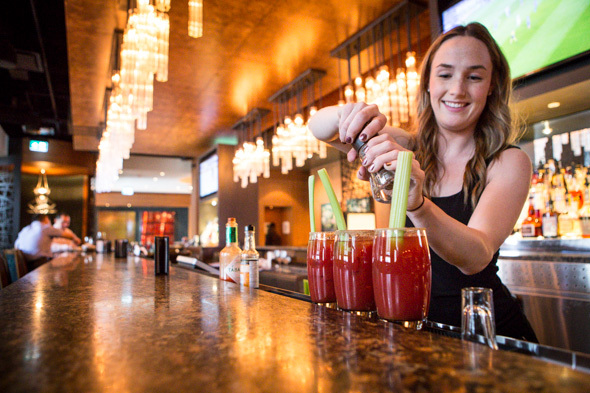 At the bar you'll find TVs tuned into the home game (when on), though you might want to skip the draught beers (all big corporate brands) and opt instead for the signature Caesar ($7-$10). 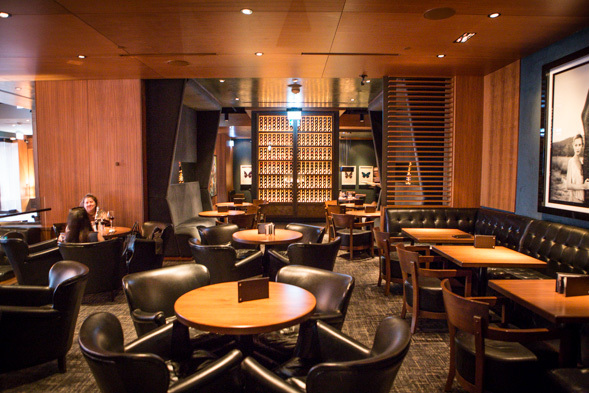 It's obvious why The Keg is still popular and thriving; it really is the Everyman's steakhouse. The menu strives for consistency and broad appeal (it's pretty much the same no matter where you are in Canada) rather than chasing the latest trends. The addition of the new shareable bar menu is perhaps the sole exception. Dishes like Tuna Tacos ($13) are part of a concerted effort to offer more casual shareable plates. 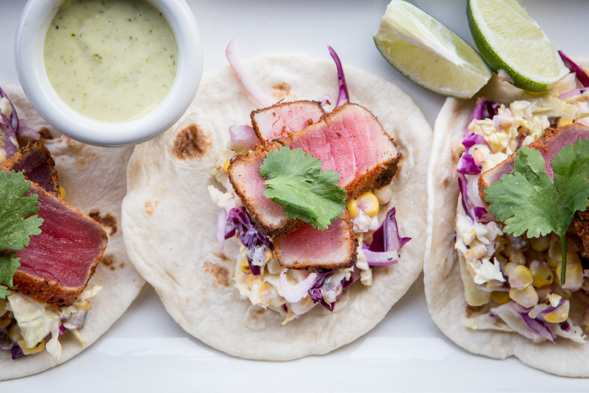 Served a trio at a time, the pepper-crusted ahi tuna is seared then sliced to show off its rouge centre then set atop cabbage slaw and charred corn on warm tortillas. Everything on the menu is rather mainstream, but presumably that's the point. What I'm here for is a steak, and what I'm pleasantly surprised to discover is that there isn't a cut of meat on this menu priced over $40. They don't parade out raw cuts to inspect the marbling, nor is this meat imported from rare Japanese cows. The priciest cut is the 20oz rib steak that comes in at $38, while a 12oz New York Striploin is $33, and the ultra-thick "We can only cook it to medium rare" 12oz Baseball Top Sirloin I ate was $29. Each comes with a choice of side dish too. 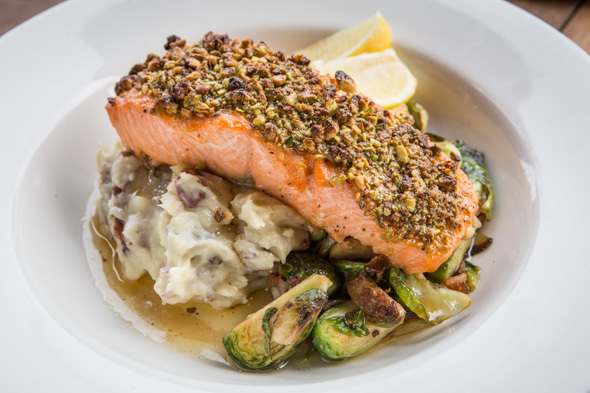 The pistachio crusted salmon ($30) is a good value too. The fish was nicely cooked and served over a mountain of mashed potatoes with bacon-studded roasted brussel sprouts. Perhaps the most alluring feature at the new King St. location is the street-facing patio outfitted with oversized umbrellas and a fireplace. Well, that and a consistent, properly seasoned steak.